Make a fresh start to 2016 with acrylics & mixed media, “Essence of Spring” themed workshop. Learn how to combine various mediums and techniques to create patterns and texture to reflect the elements of springtime. 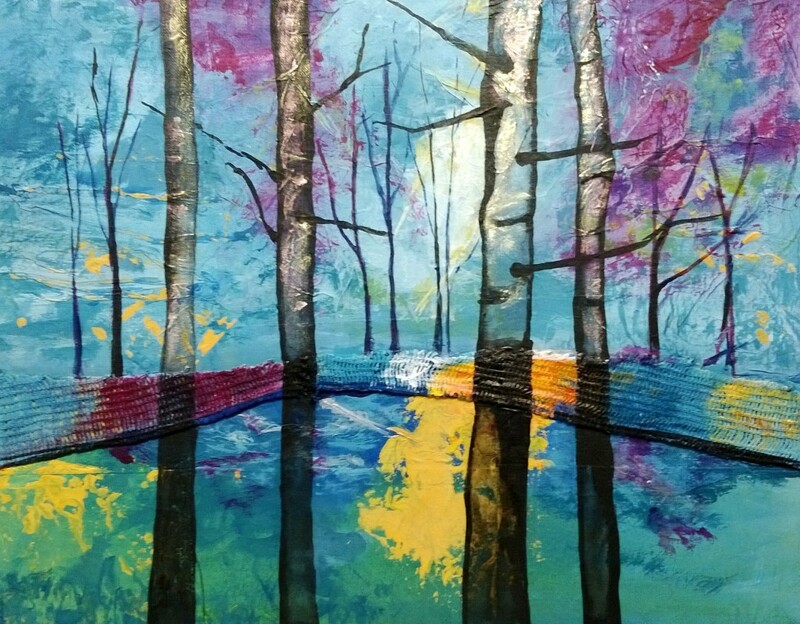 The idea behind this block is to have fun and explore creating either a realistic, semi-abstract or abstract piece of work representing the “Essence of Spring” using acrylic paints, mediums, pastes and gels combined with some stencils collage and other ephemera. Other dry or wet media may also be combined e.g. pastels, charcoal, inks etc to produce different marks or patterns (depending on your painting). Bring with you any sketches or pictures you would like to use as reference for your paintings, also any items you may want to use as collage for texture or pattern. Wk 3-5 – Develop further layers, add further marks & effects, refine and adjust composition to finish stages. Fee is £12.50 per week pay as you go or £67.50 to book the full 5 weeks. PLEASE NOTE: This block is now FULLY BOOKED! However I can take advance bookings for the summer/autumn mixed media sessions so please contact me to be added to my waiting list. Also COMING UP IN SPRING 2016! April (4 weeks) 7, 14, 21, 28 – People & Places, Exploring Urban & Rural Scenes with Mixed media, Pastels, Acrylics or Oils. For more information, pre-booking please contact me at info@artjournals.co.uk.